"Northland, 1845. When Hene's twin brother falls dangerously ill, her parents fear she will also catch the sickness, so they send her away from her home at the pa to the Paihia mission station. Life with the missionaries is difficult. Hene must wear a hot European dress and learn... read full description below. 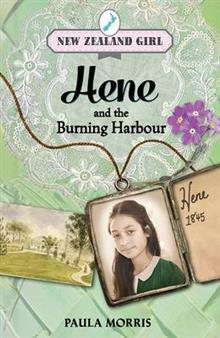 Book two in the New Zealand Girl series, Paula Morris's Hene and the Burning Harbour tells the story of Hene, a Maori girl living in 1840s New Zealand. Northland, 1845. When Hene's twin brother falls dangerously ill, her parents fear she will also catch the sickness, so they send her away from her home at the pa to the Paihia mission station. Life with the missionaries is difficult. Hene must wear a hot European dress and learn to sew, which she hates. Meanwhile, across the water in Russell, the world is in turmoil. Hone Heke has cut down the flagpole again and has attacked Korororeka. Hene sees smoke and fire from across the bay; the town is on fire and her best friend from the mission house, Rangi, is trapped there. Hene is the only one who can save her. What was life like so many years ago? Find out through the eyes of a girl who's just like you. Paula Morris (Ngati Wai) was born in Auckland. She is the author of a short story collection and four adult novels, the most recent of which was Rangatira, fiction winner at the 2012 New Zealand Post Book Awards. She has also written young adult fiction, including Ruined, first published in the United States, which has sold more than 300,000 copies.